You might be able to beat Off Constantly, but you will never beat Hobnob's burgers! 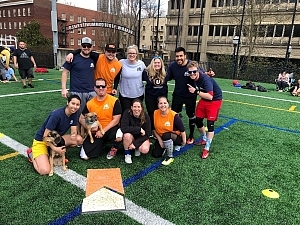 Coming back together for another run at some fun on the field, followed by beers and delicious food at HobNob Bar and Grille! Stop by at SE Morrison and 34! The rare Week 2 opening day happened this week for Off Constantly, a veteran team with a shining new star: Krystle Coombes. Krystle stepped to the plate like she had played 100 games before, laying down some textbook bunts, and giving the heavy kickers runners to work with. Great first day Krystle!